The Tararua Ranges. at the back door playground for this in the lower North Island of New Zealand looking for an outdoor adventure. From central Wellington to the road on the western side of the ranges takes approx. 90 minutes. And from there it’s all up hill. 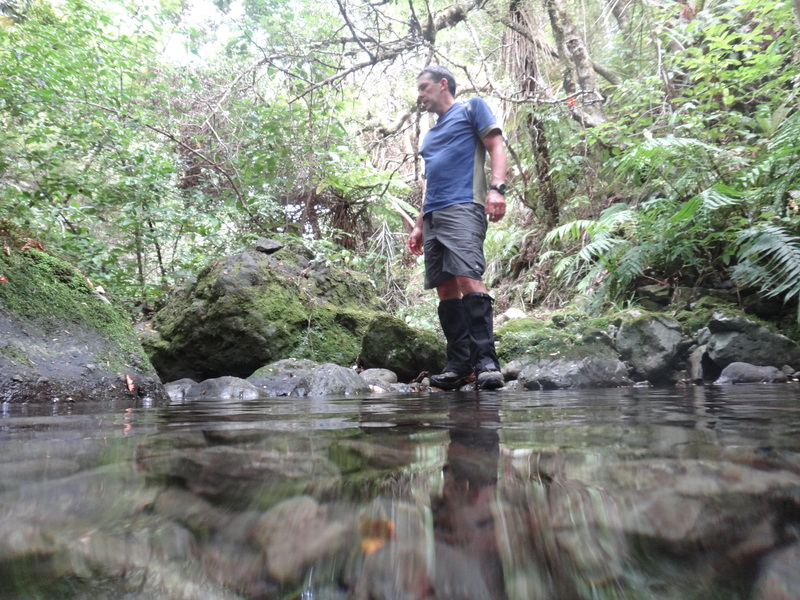 When I was living in Wellington it was not uncommon for me to head out to the “Tarauas” for an overnight trip. And it was an awesome place to walk with “Bax”, my German shepherd dog that I was, at the time training as a wilderness search dog. Once I moved to Sydney I missed the extreme’s that the Taraura’s offered; extremely wet and extremely step rugged terrain. And then the opportunity work in Wellington for a week and than stay over for a long weekend was too good to believe. 4. Planned trip distance 25 km approx. Now I’ll admit I was pretty brash in my facebook post, made just days before we left on this trip – “I just need to stay ahead of him (Hugh) for 3 days”. It was an easy statement to make but not as easy to live up to – after three days of “up hill and down dale” I’ll confess I came in a distant second, but hey it was a great trip and for those that understand the competition that exists in our group, a benchmark has been set. 6am the alarm is ringing but despite the early hour we’re both keen to get underway. Work bags packed and stowed until Monday and next stop Wellington train station for the short trip out to Melling Station where we are meeting Nicole, who is taking the opportunity of a gap in her roster to join us with her 2 retrievers, and head for the hills. And to our advantage – Nicole has a vehicle and can get us to Otaki Forks without having to piece together a puzzle of train, bus and taxi timetables to achieve the same end result – thanks Nicole. 9am and we are already heading across the grass covered terraces above Bioelle Flat to make a start on the 1,100 metre climb to Bridge Peak, our first significant decision point in the trip. But first stop the geocache that Nicole has to “tag” at the log chair about 30 minutes below Field Hut. It is here that Nicole makes the decision to turn back to give the dogs a break in what is turning out to be a hot and dry climb to the clouds. After our goodbyes Hugh and I complete the last few kilometres through to Field for a lunch break. It’s a welcome relief to find water in the tank. Presently the Wellington area is experiencing a record (worst in 47 years) drought. see, at best one. It doesn’t take long to solve the mystery – the construction crew are resident in the old hut while working on building the replacement. And it’s even more evident we won’t be stopping here tonight – the tarns are dry, the hut is unavailable and 6 plus one dog is a crowd, so we make the decision to confront the 5 hour trip through to Maungahuka Hut in the remaining 5 hours of daylight but first – 40 minutes down time! 3:30pm On your feet, we need to get going. Hugh is driving us on toward days end, and hopefully Maungahuka Hut. A short reversal over 100-200 metres already travelled and we are onto new ground again. 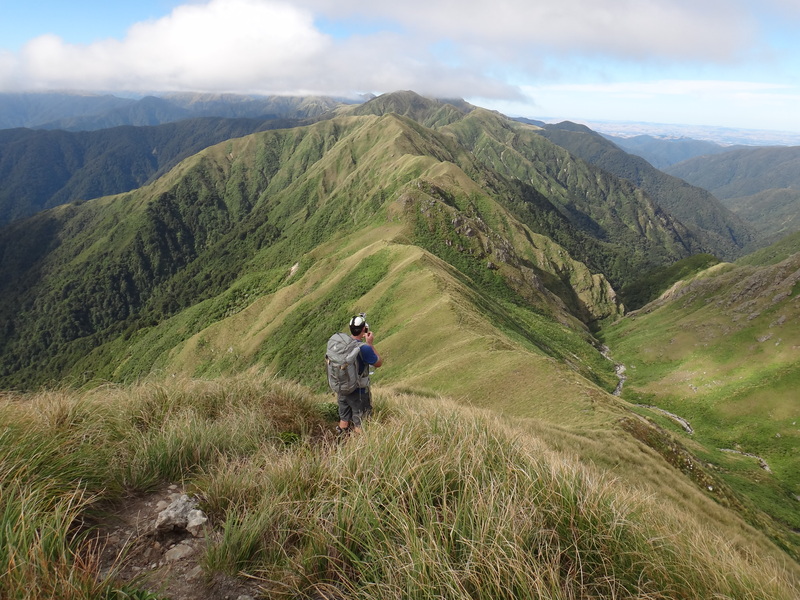 Now we are heading north, along the Tararua Range. It’s not quite knife edge stuff but if all you’ve walked in/on in recent months is the Blue Mountains then this is definitely something to behold. The ridge stretches out as far as the eye can see and over the next 4 hours we are going to become intimately acquainted with every rise and fall that it makes. It’s almost as if the original track marker wanted to step on every high point possible, there’s no sidling around the edges of any prominence. The only way is straight at the top and then down the other side heading straight toward the next summit regardless of size. In this way we make our way past Boyd-Wilson, Vossler, Yeates and finally Mt McIntosh before striking the 3 Taraura peaks and the ladder. 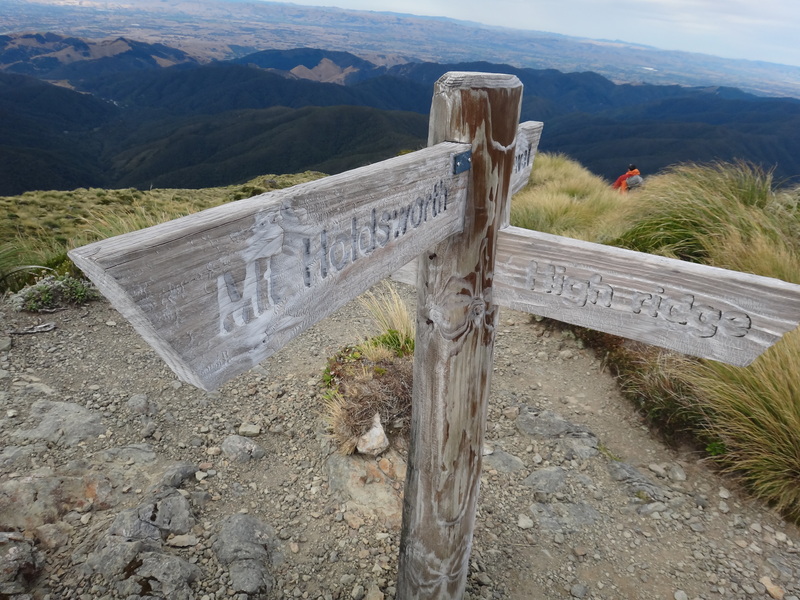 Once past the ladder there’s the final few kilometres to Maungahuka Hut and these kilometres drag by for me. My legs are beyond aching, they are now stinging and downhills are a real struggle. But again the track architect has taken us up and down every small peak enroute to the hut. Finally Maunguhuka comes into sight as we crest the last rise and just in time too – the light is getting quite dim, the legs have almost stopped moving and motivation to keep moving is at a trip low. End of day one – clouds being pulled across the range. 8pm Water has been boiled and added to the Back Country dehydrated packs and it’s not long before packs are opened and sleeping bags prepared and at last food is consumed. 9pm Bed, sleep and someone snoring !! 7:30am My legs are stiff and sore and I need to try moving to find out how severe the aches and pains are going to be. The sun is just coming over the ranges in the west and getting some good photos outside is a priority. A lap of the hut with cameras in hand searching out the next “photo of the day” produces some good results (well I think so anyway). 8am A short return to the sleeping bag can’t hurt surely and Hugh has yet to make any threatening move toward the coffee. 10am OK, so short wasn’t that short and neither of us are close to the the start line for today’s trip through to the Mid Waiohine Hut. Over the next 80 minutes we manage a simple but ample muesli and fruit breakfast plus a few cups of coffee each. Finally at 11:20 we have pointed ourselves to Mt Aokaparangi and we are underway. 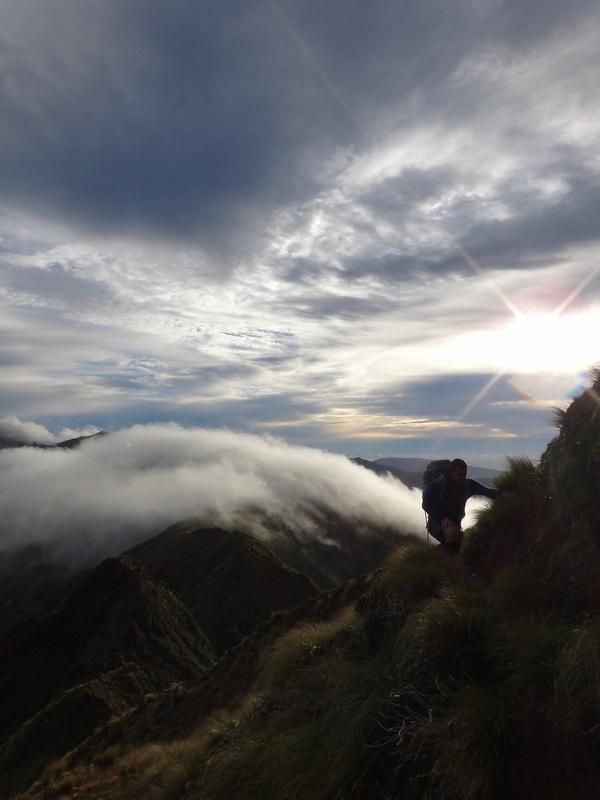 The plan for today is to check in on Aokaparangi Hut for lunch, that should be about 2 hours out and then close out the day with the 3-4 hour walk down from the ridge through the forest to finish at the Mid Waiohine Hut. It’s blowing but nowhere near the force that we experienced as we came along the Range yesterday. It’s very slippery underfoot, the alpine grasses have dried off in the drought and shed their dead but shiny leaves that are now acting as underfoot lubricant. And with the low scrub and what’s remaining of the grasses providing a screen to block your view of the ground, walking can at times be treacherous. Midday Taking a loss of 300 metres hard gained height to visit Aokaparangi Hut didn’t win any support so after a quick break for some food we have reached the summit of Mt Aokaparangi and about to head east and commence the trip down to the bush line. Once into the bush our speed of travel slows, not that it was that quick beforehand, as the step, and uneven terrain makes route finding and foot placement more difficult. Once again the impact of the drought conditions is evident. 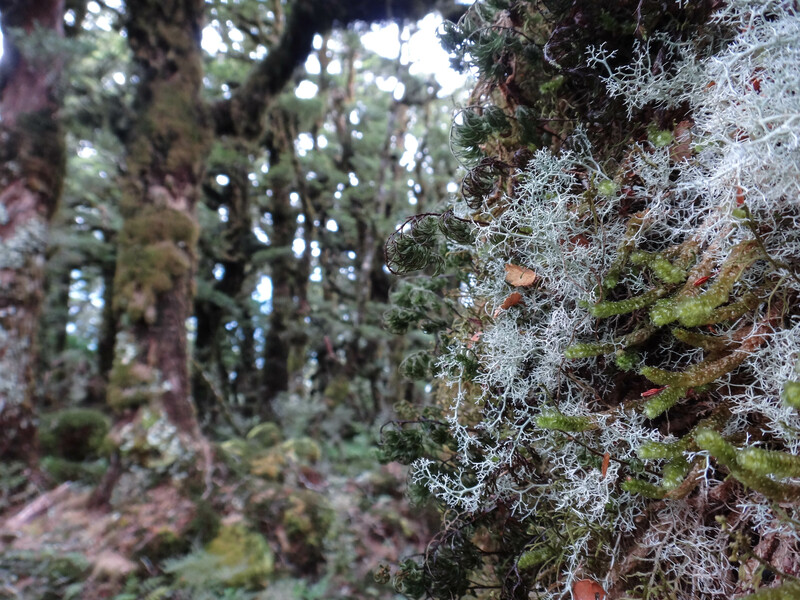 Mosses that under normal wet Tararua conditions are rich greens in colour have been replaced by dry, brittle and browned off replacements. Once we complete our descent of the ridge we are faced wih a crossing to the eastern bank of the Waiohine River and this provides us an opportunity to make use of the infamous DOC swing bridge. With the sides and base constructed of steel wire netting with steel bars for additional foot support on the base bridges are standard fare in the New Zealand outdoors. Usually rated as suitable for 1 user and having a suitable amount of slack in the support wires to make the traverse from one side to the other more like a mini trampoline experience. Once over the swing bridge it’s a short 20 minute walk up the eastern bank of the river to find ourselves alone at the Mid Waiohine Hut. This afternoon we have a few hours to spare before nightfall. First up, where’s the water supply? There’s no tank collecting run-off from the hut roof. The WATER sign suggests there’s access to a nearby creek, and yes it’s flowing but the drought conditions have reduced the flow to slightly above a trickle and it’s only the dam created by previous hut occupants that provide a pool sufficiently deep enough to scoop water from. Second priority – rest those tired legs by checking out the bunk beds. Old wire sprung bases and foam mattresses. No match for the hotel bed I experienced through the past week but a welcome experience none the less. By end of day, that comes early at 9pm, we’ve managed to focus long enough to take a walk down to the river and spot the large brown trout in the deep pools and also spot some deer tracks in the sand. And of course dinner – another round of Back Country dehy. We knew that we were in for an early start today. We had phoned through to Nicole the previous day for an update on the weather forecast and with rain and high winds due around midday we had decided that it would be best to make for an “Alpine Start” and be heading down from the tops by midday! 6am the alarms go off, it’s already raining, team decision – there’s no point to start the race as we’ve already lost to the weather. 7am OK we really do need to get moving or else we’ll miss our ride back to Wellington. 8am Fed, packed and underway. It’s straight out the hut door and climbing. Today we start straight into a 1,000 metre to climb to the summit of Mt Isabelle. 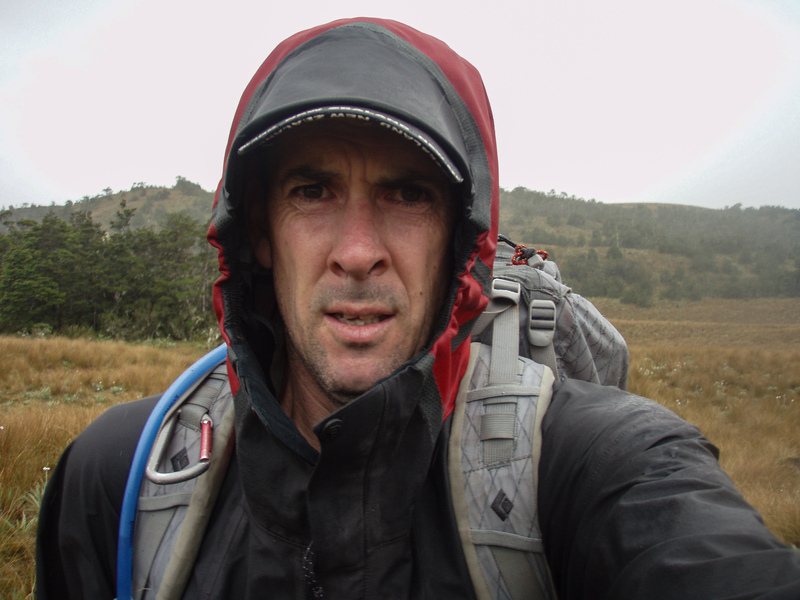 Hugh’s in front and the pace is good – “Pole Pole”, the call from the Kilimanjaro guides rings in my head as I make a conscious effort to stay slow and steady. 35 minutes later and we’ve put on 250 metres of height. A quick stop for a drink and we are underway again and for the next 2 hours we continue upward. 10am and we are holding just below the tree line and taking the opportunity to don jackets as the wind is really starting to howl across the slopes that lie above us. When we step out into the wind we find it almost impossible to talk to each other and at one point Hugh cops a tail wind gust and uses its power to lope off uphill ahead of me. I’m taking a more cautious approach – the track, if it can be called that, travels close to the edge of a significant drop and the wind gusts are pushing me closer to that. For me it’s a case of bracing against the gusts and making whatever progress one can as the wind drops in intensity. Midday The rains held off, the wind has decreased a little and we have reached the trig station on the summit of Mt Holdsworth. We are congratulating ourselves on a successful trip and already trying to identify a future trip that can come close to matching the challenge we’ve just completed. Apparently Tasmania is now on the cards…. Hi, thanks for dropping by and "tracking my adventures". I am a New Zealander living in Sydney Australia. I love being in the outdoors and escape the city as frequently as possible to get my "fix". In recent years my adventures have taken me further from home and I've come to realise there's also a lot of enjoyment that comes from getting on location. Seeing new cities and meeting the locals as become as much a part of the adventure as the trekking or climbing itself. It is an exciting experience for me and one I hope to continue for some time.